Beauty is timeless and apps are the toll of the times. These beauty apps are helpful on the go, and offer all your needs right at your fingertips. 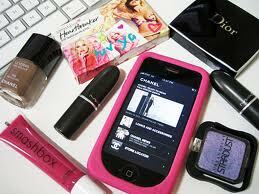 Make-up, news, tutorials, and and easy purchasing for the beauty-lover on the go! With this app, you can try on any hairstyle and see which one works best for you. Test out your next look from home with no hassle! Ever wonder how make-up will look on you, but don't want to go through powder, after eyeshadow, after lipstick? Download this app. You can test looks on your own picture! Test out your favorite Sephora products before heading out to the store. You can stay up to date on deals and new products, too! Get a preview of how the colors will look on your hand--before painting. For the nail polish addict, this is a must! Download on your Android and iDevices now!